"Films don't get much bigger than this." It's back! For the 50th Anniversary of its original release, BFI is restoring and re-releasing David Lean's 1965 classic Doctor Zhivago, which won five Oscars, including Best Cinematography, Best Writing and Best Score. So far it seems like this is just in the UK, via BFI, but that doesn't mean it won't get over to the US soon in its restored form, too. The updated version of Doctor Zhivago is a digitally restored 4K DCP, with a runtime of 200 minutes, starring Julie Christie, Omar Sharif, Tom Courtenay, Geraldine Chaplin, Rod Steiger, Klaus Kinski and Alec Guinness. It's a gorgeous, and fittingly epic trailer for this epic romance, filled with tons of footage from the film and that amazing score. If you haven't seen it yet, you really need to get to theatres to watch this film. Take a gander. An epic romance set against the backdrop of the Russian Revolution, David Lean's Doctor Zhivago is one of cinema's great love stories. In Moscow on the eve of the First World War, medical student Yuri Zhivago (Omar Sharif) meets the beautiful Lara (Julie Christie), setting in train a fateful romance that turns their lives upside down. Featuring excellent supporting performances by Alec Guinness, Rod Steiger, Geraldine Chaplin and Tom Courtenay (45 Years), Doctor Zhivago portrays at its heart an intensely human and passionate relationship, challenged by the monumental politics of tradition and war. 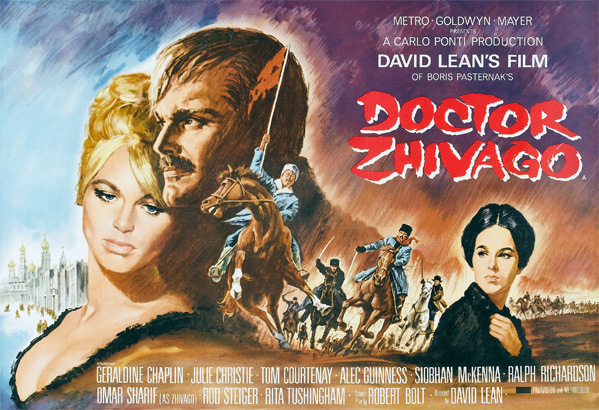 BFI is re-releasing Doctor Zhivago in UK cinemas starting November 27th this year. For more info + details on how/where to see this film in the UK, go here. We're still not sure about a US re-release plan yet. One of your favorites? Yis. An must-see for film buff's everywhere. I think it has been nearly a decade since I last viewed this master-piece. I hear that main theme every time it's mentioned. I can't be the only one, right?